Available online via SciVerse ScienceDirect, or in print for a limited time only, The International Encyclopedia of Housing and Home is the first international reference work for housing scholars and professionals, that uses studies in economics and finance, psychology, social policy, sociology, anthropology, geography, architecture, law, and other disciplines to create an international portrait of housing in all its facets: from meanings of home at the microscale, to impacts on macro-economy. This comprehensive work is edited by distinguished housing expert Susan J. Smith, together with Marja Elsinga, Ong Seow Eng, Lorna Fox O'Mahony and Susan Wachter, and a multi-disciplinary editorial team of 20 world-class scholars in all. Working at the cutting edge of their subject, liaising with an expert editorial advisory board, and engaging with policy-makers and professionals, the editors have worked for almost five years to secure the quality, reach, relevance and coherence of this work. A broad and inclusive table of contents signals (or tesitifes to) detailed investigation of historical and theoretical material as well as in-depth analysis of current issues. This seven-volume set contains over 500 entries, listed alphabetically, but grouped into seven thematic sections including methods and approaches; economics and finance; environments; home and homelessness; institutions; policy; and welfare and well-being. Housing professionals, both academics and practitioners, will find The International Encyclopedia of Housing and Home useful for teaching, discovery, and research needs. Susan J. Smith, Mistress of Girton College at the University of Cambridge, held the Ogilivie Chair of Geography at the University of Edinburgh and was Director of the Institute for Advanced Study at the University of Durham. She is a Fellow of the British Academy, an inaugural member of the Academy of Social Sciences, a Fellow at the Royal Society of Edinburgh, and a member of the Society of Authors. Housing studies is a trans-disciplinary enterprise whose research, teaching and practical applications span an impressive range of social science subjects including urban studies, economics and finance, psychology, social policy, sociology, anthropology, geography, architecture and law. No area of knowledge more urgently needs a comprehensive reference work of the magnitude, scale and scope that Elsevier has assembled here. Packed with experience, imagination and innovation, the encyclopedia contains over 600 entries, each carefully created by a circle of experts. 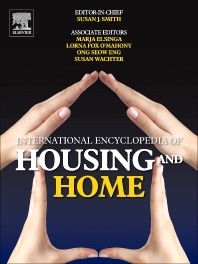 The International Encyclopedia of Housing and Home is a lively, authoritative and systematic statement of the state of the art of research on housing and home. Every entry stands alone on its merits and is accessed alphabetically. Yet, each is fully cross-referenced, and attached to one of seven thematic categories whose â€˜wholes' far exceed the sum of their parts. From methods to policy, individuals to institutions, and economics to welfare, there is something for everyone here. The work is relevant to anyone whose research, teaching or life experiences engage with housing assets, mortgage debt, the right to shelter, the problem of affordability or the meanings of home. The numerous scholars whose names appear in this work have created a wonderful new resource, borne of a truly collective effort, providing a really good read.